Twined slip-on shoe made from Rattlesnake Master (Eryngium yuccifolium). Perhaps some of the most intimate artifacts of the past are articles of clothing. Confronted by the undeniable presence of an individual person in the past, we can see ourselves in the observable mundane trivia of their lives: the knot in the ties at the corners of a wrap skirt, tiny mends in a favorite shirt, the worn heels of shoes with the perfect imprint of an individual’s foot. In the humid Southeast we have far fewer examples of these kinds of artifacts than other regions where persistent dry and cold conditions set the stage for wide-scale preservation of organic materials, but the archeological record of the Midsouth and Southeast is not entirely devoid of them. The southeastern United States has several significant karst regions, like the Ozark Plateau, that boast large, dry caves and numerous bluff shelters whose conditions are just right for the preservation of organic materials. Shoes are one type of organic artifact that have been recovered from these sites. Despite a common popular image of prehistoric Native peoples of the Southeast clad only in sewn leather, including footwear, the majority of archeologically recovered shoes were made using woven plant fiber; specifically, the leaves of a plant known as “rattlesnake master” (Eryngium yuccifolium). This plant was critical in the production of numerous types of perishable artifacts, including bags, blankets, skirts, robes, and shoes, for at least 8000 years in the southeastern United States (Horton 2010; Kuttruff et al. 1998). A remarkable aspect of the shoes from Arnold Research Cave in Missouri, the Mammoth Cave system in Kentucky, and the Ozark Plateau is that we have recovered enough of them, whole or partially intact, to describe changes in styles and construction over time (Dehart 1998; Horton 2010; Kuttruff et al. 1998). 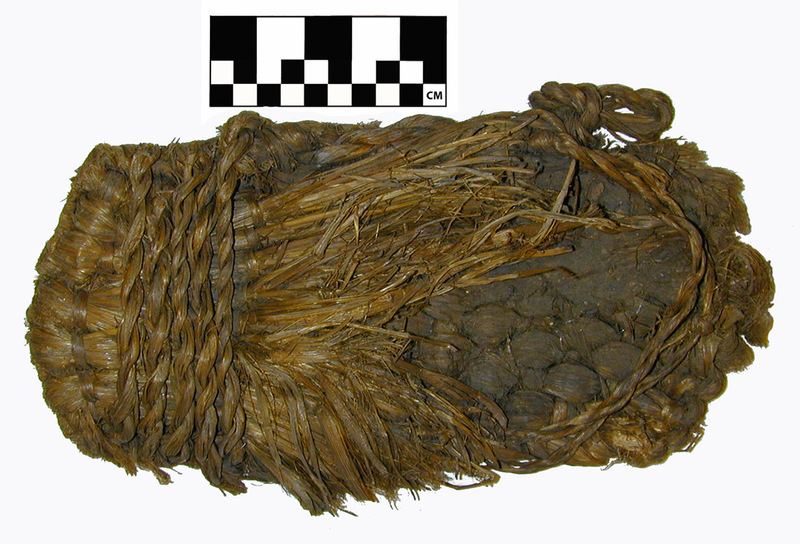 This research suggests that woven plant fiber shoes were common from the Archaic into the Woodland, whereas well-tailored, stitched leather “moccasins” are a style known more from the Late Prehistoric period into modern times. Recovered in 1932 by Samuel Dellinger’s crew, the shoe pictured here is one of four found in a bluff shelter in Benton County, Arkansas, along with hafted bone tools and fragments of plant-fiber bags, netting, and clothing (see Bluff Shelters of the Arkansas Ozarks for more about Dellinger’s explorations of the Ozark Plateau). While we don’t have a direct radiocarbon date for this shoe, its style and the other material culture of the bluff shelter suggest a Middle to Late Woodland date. The shoe itself is a type of slipper, woven from the leaves of the rattlesnake master plant. It was worn by slipping the foot under a flap of fiber folded up from the woven sole and twined together. This portion of the shoe, known as a “vamp,” was then held in place with a series of cords attached to either side of the shoe at approximately the location of the ball of the foot. A final secure fit was accomplished by means of a cord that would have gone around the back of the heel. Today that cord is still tied in a knot to one side, having been adjusted long ago to fit more perfectly the exact size of the wearer’s foot. We don’t know whether a man or a woman wore this shoe; its size falls within a range for both sexes. At about 25cm long the shoe is equivalent to about a size 8–9 in U.S. women’s shoe sizes, or a 7–8 in men’s. But the wear patterns visible at the heel suggest the wearer’s foot was a little smaller than the shoe itself, probably between about 22 and 23cm long, suggesting the person was an adult. The wearer had pretty obviously been through some wet muddy ground that had seeped into the shoe, leaving the “insole” area caked in a thin layer of mud. Of the other three shoes from this bluff shelter, one is damaged almost beyond recognition, but the other two remain intact, except for the holes worn all the way through the woven rattlesnake master fiber at the heel—wear and tear we can all relate to. While most archeologically recovered shoes from the Ozark Plateau are like these relatively open, woven plant fiber slippers, we do have some evidence for contemporaneous stitched and wrapped leather footwear (Harrington 1960). This suggests that perhaps the Indians of the Ozark Plateau may have changed their shoe styles seasonally, depending on weather and temperature, just as we do today, cycling from boots to flip flops and back again with the change in the seasons. The wear and tear we exert on shoes creates both a uniqueness and a familiarity that lends itself to a common phrase we often use when we want to encourage empathy and understanding of others. To know someone, their life, their experiences, and their history, we are asked to “walk a mile in their shoes.” We will never know the person who wore this shoe personally, but that small tie at the side of the foot, where they adjusted their shoe to fit better, and the wear at the heel, where their foot abraded the fibers as they walked the ridges and valleys of the Ozark Plateau, brings us momentarily into their presence, helping us see the past through the lived experiences of another person. |998 Technical Analysis and Cultural Interpretation of Prehistoric Footwear from Arnold Research Cave, Missouri. MS thesis, Louisiana State University. 1960 The Ozark Bluff-dwellers. Indian Notes and Monographs, Volume 12. Museum of the American Indian, Heye Foundation, New York. 2010 The Ties That Bind 3000 Years of Fabric Production and Fiber Use in the Ozark Plateau. PhD dissertation, Washington University in St. Louis. 1975 Prehistoric Plies: A Structural and Comparative Analysis of Cordage, Netting, Basketry, and Fabric from Ozark Bluff Shelters. Research Series No. 9. Arkansas Archaeological Survey, Fayetteville.